Today I've heard a couple of times (via the blogger "contact" form) from someone responding to my "Opalite is Just Glass and Not a Gemstone" post, who insists that Opalite "isn't just glass" because it's made with minerals which give it a glow. I'm not going to publish the comments and I can't respond to their email (since their settings are set to "noreply-comment@blogger.com" as their email, it goes back to me! ), so I'm going to respond right here in this separate post. Hopefully this is a little bit informative for this person, and for anyone who might read this and wonder, "If glass is made from minerals, why isn't it a gemstone?" But basically, this person today has confused Opalite (which is a man-made glass made in China for the jewelry industry as a simulated Opal or Moonstone) with "Opal Glass" which is a "thermally opalizable glass" used in manufacturing (jars, etc.) and who referred me to this patent from 1970. Glass (man-made) is made from melting minerals together at a very high temperature. These minerals are silica (silicon dioxide), limestone (calcium carbonate), and soda ash (sodium carbonate), melted at 1700 degrees C. Glass is amorphic---meaning it has no crystalline structure. The chemical structure of glass is SiO2 There are many other types of glass such as "crystal" or leaded glass (which adds lead oxide), borosilicate glass which is made with boron trioxide which makes it very sturdy and is used as test tubes and sold as Pyrex for baking, for example, "Vaseline glass", plus many other types of art glass and so forth. HOW IS COLORED GLASS MADE? There are 3 different ways to make colored glass. Adding different minerals/metal salts to the basic glass recipe results in colors of glass. Iron or Chromium is added for green glass; Cobalt for blue glass; Gold, Copper and Tin may be added to make red glass; and so forth. HERE is a great website that explains this in detail along with a great chart at the top of the page. 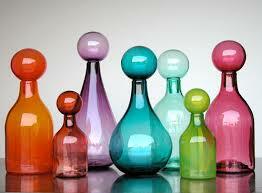 Some glass is colored by suspended particles (colloidal) of minerals in the glass. "Goldstone" and "Blue Goldstone" are great examples of glass with suspended minerals. 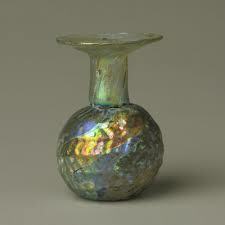 This is a type of art glass made in the 19th Century and was known as "Opal Glass", then later called "Milk Glass". It is a milky white opaque to translucent glass, but can also be found in assorted colors, formed in vases and cups and decorative objects. It was made with different recipes---sometimes using a little arsenic, sometimes tin oxide, and usually fluorite. This means that this glass will become fluorescent under a black light. It's a collectible vintage glass now. WHAT ABOUT THIS PATENTED "OPAL GLASS"? There is a patented method of making "opal glass" from 1972 that describes how "opalescent glass" is manufactured for "thermally opalizable glass". This is glass used in oven ware (low expansion, heat-resistant). As it says in the patent info, opal glasses are "widely used in the fields of science, industry and commerce in the form of containers for...cosmetic creams, deodorant containers, lighting globes..." etc. The patent goes on to describe the chemistry of this oven-safe glass. This has absolutely NOTHING to do with Opalite--a glass made in China specifically for the jewelry industry. Knowledge of basic science will tell you that everything that is not growing or living (such as plants, animals) is a mineral, or made from minerals. "If it can't be grown, it must be mined." Even living things (including people) are made of minerals. 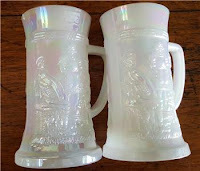 The most-read post in my blog has been regarding Opalite glass. This is a man-made glass and is often sold to consumers as a gemstone, with sellers calling it "Sea Opal" and "Opal Moonstone" and even just "Moonstone" when in fact it is NOT a gem, but is simply glass! Glass which has no crystal structure, despite being made from minerals, is simply GLASS and therefore not a gemstone. "Fused Glass" is often sold as Quartz when in fact it is also just glass (which I've written about several times as well). I wrote about Opalite glass more than once, and have posted pictures of Opalite glass and Moonstones and Rainbow Moonstones, and have answered literally hundreds of questions about this Opalite-as-gemstone scam. And it IS a scam when someone claims it is a "gemstone"! I get a lot of questions asking if something is a real gemstone (and I enjoy getting questions and always try to help). Sometimes I'll hear from someone who is trying to correct me on something---that's great! I've updated many of my posts when I get solid information to add. I'm here to learn too! Anyway, whoever "Me" is who wrote to me regarding this patent and argued that "opalite" isn't "just" glass because it's made with minerals----thank you for taking the time to send me emails. I hope you find this information helpful and informative. If you have further questions regarding glass in general or Opalite glass in particular, please provide your email address so I can respond. I just bought a freeform opal glass pendant and you're right I didn't believe them to be opals coz its very cheap only $2! But they look pretty and a nice necklace to wear on the beach or during Full Moon coz it glows like the Moon. It's a perfect necklace to wear on the beach! 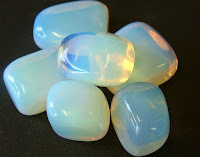 Opalite is really beautiful and it does glow like the moon. And when you can buy something so pretty at such an affordable price, you just can't go wrong!